Fig. 4.6. 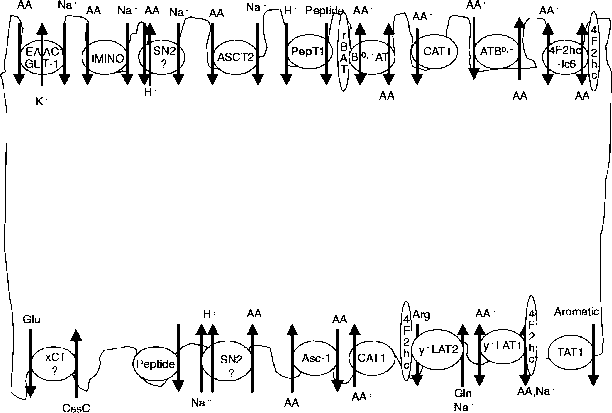 Uric acid synthesis (an abbreviated pathway to show key reactions involving inputs of amino acid N). Enzymes: 1, ribose 5-phosphate pyrophosphokinase; 2, glutamine phosphoribosyl pyrophosphate amidotransferase; 3, phosphoribosyl glycinamide synthetase; 4, amido-li CjclSO ; 5, specific synthetase; 6, xanthine oxi dciso. Following deamination and molecular cleavage, cysteine and a-ketobutyrate are produced. This pathway underpins an important nutritional relationship and is depicted in Chapter 8. The competing metabolic demands for methionine are considered in some depth in Chapter 17.